We imagine it’s fun being part of a Brazil training session, especially when the likes of Philippe Coutinho pull off nutmegs like this. With the level of technical quality and flair involved with some of these individuals, they’re no strangers to pulling off amazing tricks and skills. 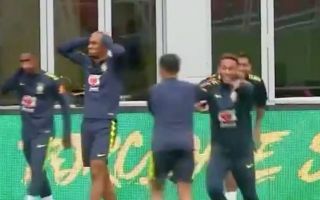 However, this was pretty special in its own right but it was made all the more memorable by the reaction it got from the rest of the squad with Neymar delighted that it was caught on camera. The likes of Fabinho and Douglas Costa couldn’t quite believe what they’d seen either, and Coutinho certainly enjoyed the adulation that he received after his audacious move. Nevertheless, after their disappointment this past summer at the World Cup, Brazil will be desperate to put things right on the pitch moving forward and while these bits of skill will continue the wonderful culture they’ve built, Coutinho will surely swap it for a goal or two in competitive action!